My God, how I loves us! I love how passionate we are about topics that the rest of the world might not neccessarily realize they need to know more about. I love how generous we are with our knowledge, gladly imparting it on the people that’s near and dear to us. I love how no topic is too big or too small to devote our time to. I love how much time we devote to it. I, for example, have a soft spot for the black plague, but I can get nerdy about almost everything. And my latest nerdy interest is geology in general, and Oregon geology in specific. I love the time perspective it offers us; how anything that happened in, say, the last hundred million years is just a short time away, how the entire human history is just a blink of an eye in the perspective of rocks, how everyting changes, just very, very slowly (did you know that mountains grow? Right this minute. Getting bigger as we speak. Or smaller, of course. Apparently it differs). Oregon geology also plays an important role in my next novel (to be published in English sometime during 2019). Which brings us to one of my favourite things about being a writer: how you can just contact nerds all over the world and ask them to talk to you about their favourite topics. And they do! 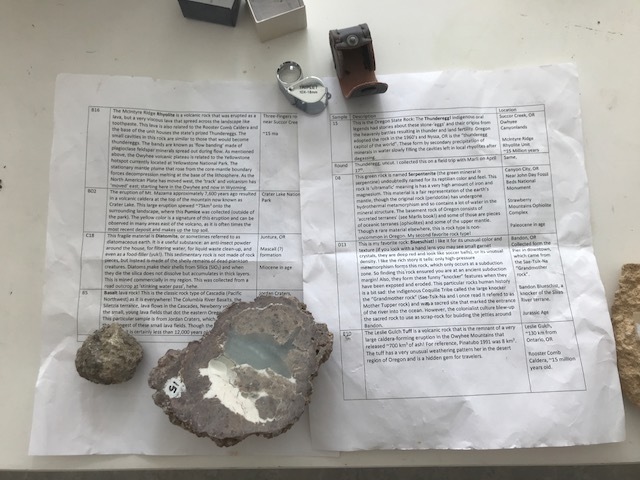 So two geologists in Oregon spent hours over Skype trying to teach me everything I needed to know about the fascinating rocks of Oregon and everyday life as a geologist. It was glorious! I’m sure there are still plenty of mistakes in my book, but no shadow falls over them. They did they best. They tried. And not only that. 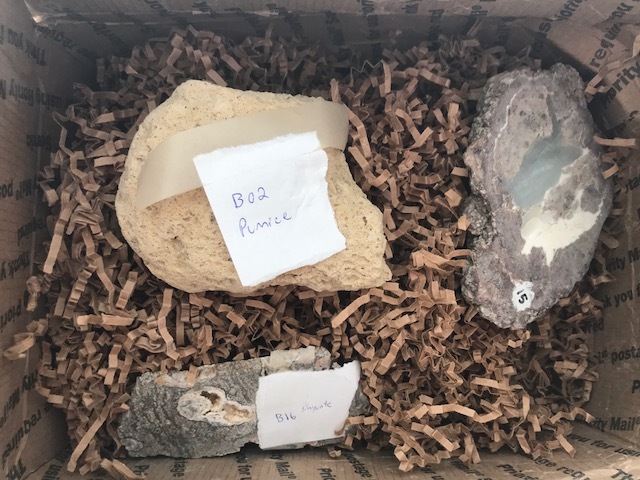 This week they sent me a beatiful collection of rocks in Oregon. How lovely is that? Together with a long list describing the different rock samples, of course. Bluechist, serpentine, basalt, thundereggs – rock samples of all different shapes and weight and feel and texture. In my book you will of course learn more than you ever knew you needed about Oregon geology, but you can already view the rock samples on my Instagram. My name there is katarinabivald, so I’m sure you’ll find me.